What Ever Happened to Our Wonderful Toys? Growing up is tough. If even the slightest attachment to the joys of one’s youth is perpetuated past pubescence, teasing will usually be the order of the day — a derision based on passions that did not subside, toys that could not be put down. TV series in the early '80s, such as Transformers , may have been naught but marketing vehicles for the branded toys that dominated store shelves, but the shows’ stories and characters inspired fantasy. The first generation (Gen 1) toys may now only be collector’s items, but they were once the playthings of children who, after madly prying plastic from cardboard, ran out into their own yards or those of friends or turned furniture into landscapes for the improvisation of original stories. This inventiveness spawned attachment, which later would invite scorn/shame and cause many to lock away their inner child to keep it safe from such corrosive forces as fiscal responsibility and familial obligations. When those who had grown up watching the Gen 1 Transformers became more or less the driving force in the USA, all they needed was someone to give the nod to make them remember — to jumpstart their dormant spark. While the Transformers movies Michael Bay ended up directing are pretty much detestable, they can be credited with the nostalgia revival that ensued — not the least of which were the video games that returned control of the transfiguring robots to the hands of the fans. Sure, re-releases of select Gen 1 Transformers came out (in very limited quantity), but those who grew up playing with the originals are no longer likely to take plastic toys out in their yards or zoom around the house with them; physically engaging with flights of childhood fantasy is sadly something largely outgrown by the time one can drive an actual car. 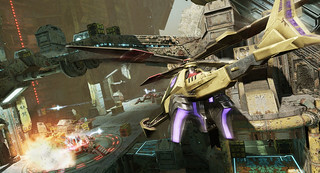 Video games such as Transformers: Fall of Cybertron ( TFoC ), however, offer a relatively socially accepted medium through which an inner child may be released to once again transform robots into the likes of race cars or jet fighters and back again to wage a war of good vs. evil or vice-versa within a 3D environment. 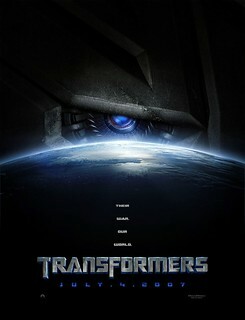 Transfomers: Fall of Cybertron takes place just before the Gen 1 animated series and tells two stories: the Autobots’ escape from their civil war-ravaged home planet of Cybertron, and the Decepticons’ attempt to annihilate that plan by every means necessary. 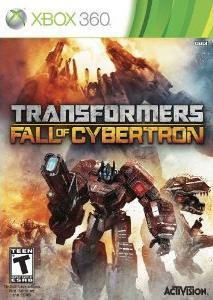 Although it is a follow-up to 2010’s Transformers: War on Cyberton , TFoC offers a completely stand-alone, fast-paced, third-person shooter with a goodly amount of humor and drama for fans and the uninitiated alike. 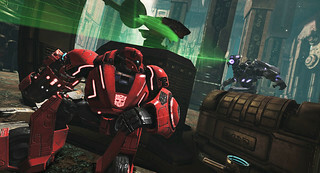 For the latter, talking to random Autobot and Decepticon NPCs, performing minor tasks (some of which are completely trite or inconsequential), and even interfacing with the Teletraan 1 terminals within the game helps fill players in on the traits and personalities of their robot avatars to enough of a degree where the story is a whole (if only slightly shallow) one. Gen 1 fans, however, get so much more. Thanks to designs by High Moon Studios, nostalgic players reap the added glee of actually recognizing the somewhat bulkier forms of the robots they loved so many years ago. This also serves to right the disappointment many felt from the über-realistic, overly machinated CG renditions in the Bay movies. Something that may be specifically troubling to fans, however, is how closely some Decepticons’ vehicle forms resemble what is destined to become their forms after crashing on Earth (when Teletraan I, the ships onboard computer, turns the aliens into the human vehicles scouted in the nearby area). While initially jarring, the plot and information derived from interacting with various terminals throughout the levels offer up a decent enough explanation while filling out the back story, making the fan heart sigh with relief. 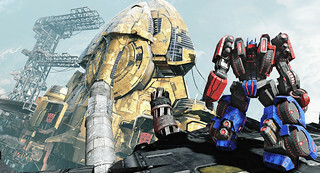 For any player, Cybertron itself offers an environmental diversity that eliminates background tedium while mesmerizing onlookers with the planet’s minute inner machinations. Panels split, rods pump, and gears whir while corridors form before your very eyes. Even static surroundings are differentiated to tell different stories. 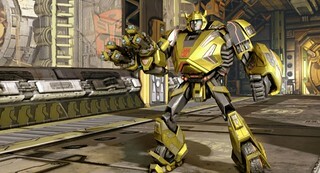 Autobot and Decepticon color palates dominate their respective levels, and neutral areas reflect a more “natural” tone. While each environment provides room to explore, this game tells a linear story (albeit in a nonlinear fashion); character movement is restricted to wide paths or open building areas, and player influence and plot outcome are set. But this game and its story are all about how you get there, and playing is 99% of the fun. While transforming is visually satisfying as an Autobot, it more or less just provides a way to get around faster, jump greater distances, or use tight spaces to sneak into different areas. If an Autobot falls off a platform ledge, it’s going to die or at the very least automatically grapple itself back to safety in a very unsatisfactory non-death. Decepticons, however, have the power of flight, so changing between robot and helicopter/jet is satisfying and life-saving and affords true freedom of movement. Not to say Autobots don’t have their star. As awesome as it is to stomp around with Bruticus or blast goody-two-bits to scrap with Megatron’s arm cannon, making Grimlock swing his gigantic sword, thrash around, and breathe fire takes the cake. Walking slowly wouldn’t normally feel all that appealing, but the way the game presents Grimlock’s heft and the seemingly effortless destruction caused by his hulking forms feels empowering without feeling cheat-code easy. 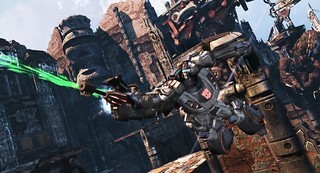 Which is a long way to say: it’s really really fun to smash stuff with Grimlock. 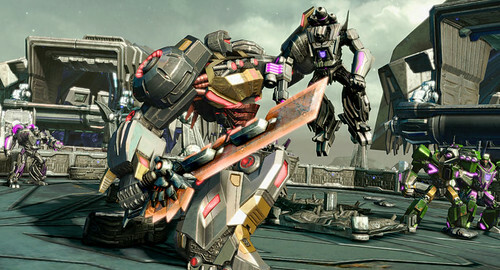 While its humor, aesthetics, and plot are definitely weighted towards fans, anyone who likes TPS shoot-em-ups can get behind Transformers: Fall of Cybertron . While its humor, aesthetics, and plot are definitely weighted towards fans, anyone who likes TPS shoot-em-ups can get behind this game. The differences in levels and playable characters’ abilities provide a unique feel to each campaign that avoids the effects that come from repetitive actions inherent in shoot-em-ups. But what is the real reason behind this game’s addictiveness? It’s fan candy. TFoC lets the player loose his or her inner child to perform the transformations, stomp around, and slay enemies with characters he or she almost remembers imagining so many years ago.